Great page to showcase where you've travelled! This is awesome, Dawn!! I love how you used different papers on the states you've visited. The planes are a great touch! I love this map of the places you've been and wishlist places you want to go!! All three kids have a map that they scratch off where they've been and so far B has the most states scratched off!! I love the large map and colors that you used on this layout. Here's to getting the rest of the states! This is cool and creative!! Oh I love this. Perfect layout. Love the map and how you highlighted the States you've visited. I love the planes as a perfect finishing touch. Fantastic way to document your travels! Love the cute airplanes too. Awesome page! Ooh I LOVE this page and this idea!! Adorable! Great idea for a page and your shadowing is perfect! This is great! I love the map. What a great way to document the states you have been too! Love this! 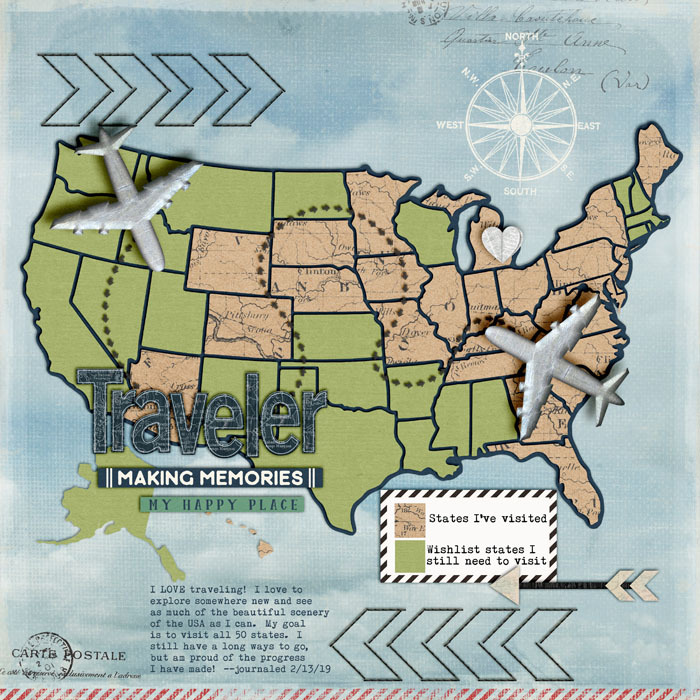 What a fun way to document your travel adventures! I love that you used a key, and the airplanes are super cute. Oooh, I love this! Love how you've documented your travels, including those planes!